I post a lot of things in the Edible Art series that, although they are, indeed, edible, you probably wouldn't want to actually eat them. Let's face it. Most of these art pieces are probably covered with all sorts of chemical sprays to keep them looking pretty and, really, they aren't meant to be consumed. That said, I feel fairly comfortable in saying that this is the first genuine Edible Art post that I've done because it's a dessert you can actually eat and order off the menu! 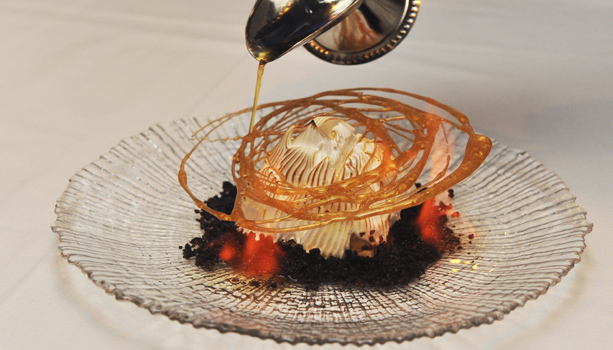 A collaboration between artist Marina Abramovic and Park Avenue Winter’s executive chef, Kevin Lasko, the Volcano Flambe turns the dessert course into a performance piece. This sweet concoction, which is sort of like a kicked up version of the classic Baked Alaska, consists of dark chocolate ice cream, meringue, and banana mousse that is covered with gold leaf and topped with spun sugar. Put all of this onto a a cookie crumb base, add a little flame of rum, and, voila, you have a Volcano Flambe! 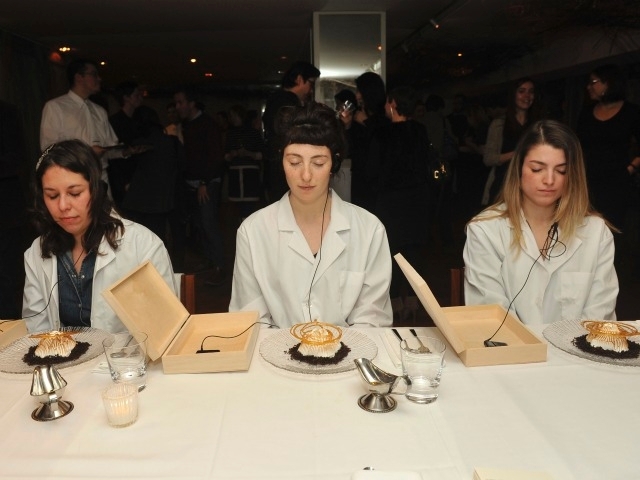 Not only is it beautiful to look at, but before the dessert is placed in front of you, you are instructed to don a lab coat and put on a pair of head phones to enhance the experience. Through the headphones, you hear Marina Abramovic telling you to close your eyes and breathe, which is actually really great advice to give someone before they start eating. It probably allows you to enjoy your food more! If this all sounds good to you, head over to Park Avenue Winter in New York City, where, for $20 you can eat art. The Volcano Flambe will only be available until March 20th, but there will be more artist/chef collaborations at Park Avenue (enter season here) in the future. Sorry, typo. Spell check doesn't cover the titles. Thanks for letting me know. Thanks for sharing! I really love stuff like this.